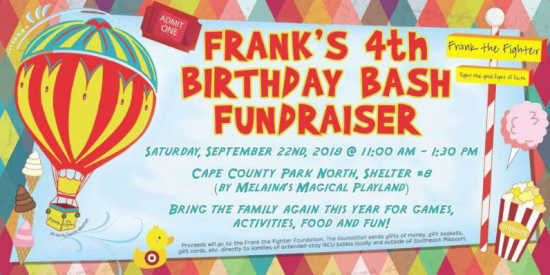 Please join us for Frank’s 4th Birthday Bash Fundraiser! Bring all your friends and family and help us make this event a success. There will be FUN FOR EVERYONE! The fun begins at 11 a.m. and ends at 1:30. Purchase tickets at the event, just look for the ticket table! Tickets are used to: buy food, drinks, play games. There are separate tickets to purchase for the raffle items. We will serve food/beverages until they’re gone. Raffle and silent auctions will end at 1 p.m. and winners will be announced! You do not have to be present as time of drawing for the raffle items.